Here’s a picture I took of Tecate this past week-end (Jan 07), He’s such a meek little sweetie. He has settled in with us quite comfortably here in Southwest Florida. On the weekends, when the morning sun shines brightly, I will place Tecate on one the coconut palm leaves out front so he can enjoy the warm rays and stretch his wings and feet. Although it might be tempting to take flight, he chooses to just perch and carefully survey his surroundings. He studies every bird that he sees, maybe many of them for the first time. See, the Florida Gulf Coast has a huge variety of birds, like King Fishers, Great Blue Herons, Snowy Egrets, Osprey, Bald Eagles, Pelicans, along with many more that are rather large. With the tropical warm weather we have most of the year, most of the birds have decided to just kick back and stay permanently. Quite often, as he’s peering out at the water through the sliding glass doors, he’s see a large bird glide right on by. He sounds off with a sharp screech! So as to warn them, “See this Beak!? Do ya’ wanna piece u’ me! ?, Well, do ya’!? Don’t make me have to get Mid-Evil on you!! !” He won’t let up until I report to him. Once I acknowledge his call, he’s satisfied that his job is done. He’ll then hop around in his large cage almost as though he’s playing a game of “Catch me if you can!” So I’ll open his cage door and I’ll reach in, and like a flash! He’s on my arm and ready to explore with me. I was fortunate enough to get this gorgeous Chestnut Eared Aracari from Jerry this past November. He’s already 5 years old and has already accepted us as his family. 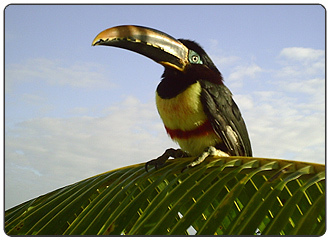 We named him Tecate (name of a Mexican beer) because it sounded just right for a Toucan. He responds directly when we call his name, with high hopes that we’re heading right over to him so he can catch a cuddle or a shoulder ride! Just about every time, he get’s his wish!! He thinks he’s a puppy! In the evening, he especially wants me to hold him close and cuddled right up to my neck under my left jaw.. I’ll gently stroke his forehead and he’s go right to sleep like a baby. I cannot even begin to explain how wonderful it is to have such an extraordinary treasure! He is genuinely precious, and is so very special to me.